Do you know your computer which program are connecting internet? Here will showing you two sets of free-to-use network monitoring program – Currports and Moo0 ConnectionWatcher, which allows you to easily understand the program using which port and the network traffic . 1.Currports is a standalone executable program ( 55KB ) .It displays the list of all currently opened TCP/IP and UDP ports on your local computer and allows you to view a list of ports that are currently in use, and the using application . You can close a selected connection , terminate the process and export all or selected items to a HTML or text report. Additional information includes the local port name, local/remote IP address, highlighted status changes and more. Download Currports and supports Window 2000/2003/XP/Vista . 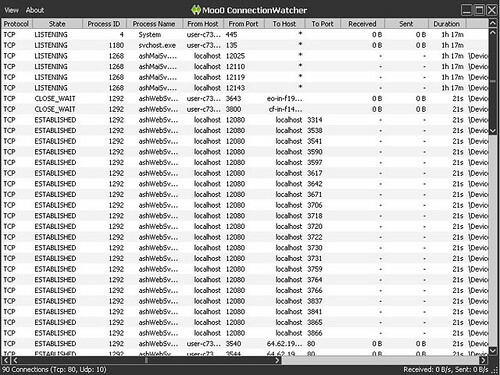 2.Moo0 Connectionwatcher is developed by a Japanese that enables you to watch over any TCP/UDP connection from/to your PC.using this software,you may discover which software sends/receive information with whom in details. Right click on the item of connection process will showing you ‘locate program’ , ‘disconnect’ , ‘Close program’ and ‘ Kill program’ in details. Download Moo0 connectionwatcher and supports window XP/Vista.